In the historic days of the 18th century around Louisbourg in Cape Breton, Nova Scotia, a cannon gun was used as a defense mechanism against any attacks. A re-creation of those days and the defense mechanisms that were used can be viewed at the Fortress of Louisbourg from the beginning of May until the end of October. Cannon Gun at the Fortress of Louisbourg, Louisbourg National Historic Site, Highway 22, Fleur de lis Trail, Marconi Trail, Cape Breton, Nova Scotia, Canada. 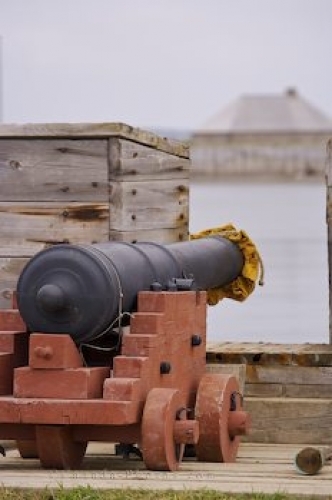 Picture of a historic cannon used as a defense mechanism at Louisbourg, Nova Scotia.